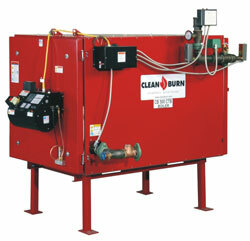 Clean Burn offers the industry’s only coil tube boilers engineered from the ground up to boilerburn waste oils. They efficiently recycle waste oils as a free fuel source to generate hot water, and are remarkably versatile for a wide range of applications, such as car wash facilities, baseboard heating, space heating, in-floor heating and ice melt applications. Only Clean Burn offers three sizes of waste oil coil tube boilers, each UL listed for use in central heating systems. These can be used in combination to create a boiler system perfectly sized for any facility. As the industry gold standard for robust construction, reliability and long service life, Clean Burn provides a greater return on investment than any other equipment of its kind. The Clean Burn 200 Waste Oil Boiler has a 200,000 BTU/hour output and heating surface of 39-square-feet. Maximum oil consumption is 1.4 gallons per hour. Recommend clean out is every 750 hours. Accepts crankcase, ATF and hydraulic #2, #4 and #5 oils. The Clean Burn 350 Waste Oil Boiler has a 350,000 BTU/hour output and heating surface of 68-square-feet. Maximum oil consumption is 2.5 gallons per hour. Recommend clean out is every 1,000 hours. Accepts crankcase, ATF and hydraulic #2, #4 and #5 oils. The Clean Burn 500 Waste Oil Boiler has a 500,000 BTU/hour output and heating surface of 97-square-feet. Maximum oil consumption is 3.57 gallons per hour. Recommend clean out is every 1,000 hours. Accepts crankcase, ATF and hydraulic #2, #4 and #5 oils.